Today we have an interesting article from Mark Foley of Trainer Trends about the Aintree Grand National meeting that kicks off tomorrow. But before we get to the article I just want to tell you about the big race trends service that Mark is offering for the three days of the Aintree festival. 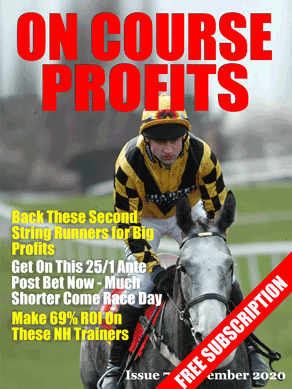 If you joined Mark for Cheltenham then you will know that he had a very profitable Cheltenham. The highlight for me was using the Free £50 bet that Bet Victor gave on Champagne Fever at 7/1. Mark is doing exactly the same for Aintree for just £14.99 for the 3 days – Click Here to secure a place for this. How does Cheltenham form hold up at Aintree? Backing favourites isn’t everyone’s cup of tea, but knowing whether a favourite is strong or weak is fundamental to having a bet. It’s impossible to ignore Cheltenham form when it comes to forming the market at Aintree and the bookies have often got it horribly wrong, horses that looked invincible at Cheltenham a few weeks earlier have looked a shadow of themselves at Aintree. In the past 10 years you would have made a small 3% loss following the 147 Aintree favourites who earned their market position on the back of their run at the Cheltenham festival. Two completely different tracks; left handed; right handed; undulating; flat; stiff finish; flat finish, long run in. So is it worth backing a Cheltenham horse that goes off as favourite at Aintree? It would have taken a brave man to oppose the following horses after their scintillating performances at Cheltenham Denman (twice; Evens and 5/4); Imperial commander 11/8; Master Minded 2/5; Albertas Run 6/4; Kauto Star 4/7. They all got turned over at Aintree of course despite their short prices, so how do you find a reliable favourite at Aintree? The first point to note is that runners that finished in the first 2 at Cheltenham tended to do well at Aintree; add in the runners that didn’t finish their race at the festival but still went off as favourites and the results are transformed. Impressive figures and following such runners would have seen you make a profit in all but 2 of the last 9 Aintree festivals. The next salient point is that the favourites over the shorter distances had the best record; it would appear that the speedsters don’t have quite as much taken out of them as the runners over longer distances. Seventeen winners from only 28 runners for a 107% return in races over 16 and 16 ½ f.
(Runners who went off as favourites at Aintree having run at the Cheltenham Festival). The above four trainers have provided over 50% of the 47 winning favourites who also ran at the Cheltenham festival in the past 10 years and Nicky Henderson’s record in recent years has been particularly impressive. In conclusion, following the runners who went off as favourites at Aintree who finished in the first 2 (or failed to finish) at the Cheltenham festival; runners over the shortest distances and runners trained by the above trainers proved to be reliable favourites and were profitable to follow. I hope your day 1 went well? I had a cracking day which got off to a great start with Champagne Fever, hopefully you had a little on that one? Our recommended tipsters had a great day as well. Mark Foley had 3 selections and made just short of 5 points profit on the day. I've just spoken to Mark and he has agreed to open up his Cheltenham offer for another few hours, so if you want to get on today's selections – Click Here. If you're betting eachway today the bookmakers are pretty much aligned with their terms, except..
5.15 Everybody is paying 4 places except Blue Square and Ladbrokes who only pay 3 places. Yesterday we didnt need Victors £50 refund as we had the winner. Today we are going to take advantage of Coral who will refund £10 whether we win or lose if we bet in the first race.